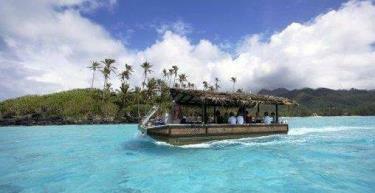 Pacific Resort Aitutaki Reservations. Call 020 7962 9933. Situated on a triangle-shaped atoll rising four thousand metres from the floor of the Pacific Ocean, Pacific Resort Aitutaki is the Cook Islands' only international luxury resort and a member of the Small Luxury Hotels of the World collection. Here you will discover an enclave of romance, refinement and luxury that beckons to even the most discerning traveller. Pacific Resort Aitutaki is limited to just 27 absolutely luxurious beachfront bungalows, suites and villas, all with their own personal, panoramic view of Aitutaki's world-famous lagoon and where each sunset majestically colours the ocean beyond. All rooms are air-conditioned, have king size beds, IDD telephone, TV, CD stereo system, in room safes, ceiling fans, hairdryer, mini bar, beach shower and spectacular views. Indulge in an invigorating trek to the highest point of the island, or a reinvigorating Polynesian massage or beauty treatment at the resort's tranquil spa complex. Spend your days swimming, sunbathing, exploring rock pools, kayaking around the islands and its small islets, or head out for a spot of fishing (then dine on your catch for dinner!). There's something for everyone at Pacific Resort Aitutaki. The tranquil island setting will sooth your soul but the cuisine will fire up your palate. The signature Rapae Bay Restaurant features the very best of tantalising South Pacific cuisine, complemented by superb attention to detail in every exquisite menu. The Black Rock Cafe is the hugely popular beachfront bar. Sit back, relax and enjoy a tropical cocktail while you delight in spectacular sunsets.